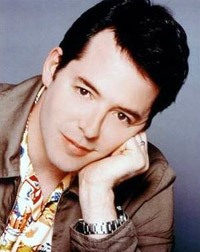 Matthew Broderick played the truant teen in the popular comedy Ferris Bueller's Day Off. It remains his most famous role, but he was a successful actor before and after that film. He first stepped on the professional stage at age 17, in a production of Horton Foote's play On Valentine's Day, starring his father. His first film was supposed to be No Small Affair, starring Sally Field. He prepared for months and they filmed for two weeks, until the film's funding was yanked. It was finally financed, recast, and released two years later, with Demi Moore and Jon Cryer. At 19, Broderick turned down the role of Alex Keaton on Family Ties, a role that went to Michael J. Fox. At 20, Broderick finally made his film debut in Neil Simon's Max Dugan Returns. At 21, Broderick appeared on Broadway in Simon's Brighton Beach Memoirs, winning a Tony for his performance. The 1983 film War Games, with Broderick as computer-savvy teen who hacks into the Defense Department's mainframe, was Broderick's first big hit movie. Ferris Bueller was filmed three years later. He won a second Tony in 1995, for How to Succeed in Business Without Really Trying, but he was passed over for a third Tony for his performance in the huge hit Broadway production of Mel Brooks's The Producers. In 1987, while Broderick was vacationing in Northern Ireland with his then-girlfriend Jennifer Grey (who'd played his sister in Ferris Bueller), he steered his rented BMW into the opposite lane and it collided head-on with an oncoming car. Margaret Doherty, 63, and her daughter Anna Gallagher, 30, were killed. Doherty's son Martin Doherty was crippled. Broderick and Grey were slightly injured. Broderick, whose blood tested negative for alcohol, was charged with causing death by dangerous driving, and under Irish law he could have been imprisoned for five years. He was convicted only of careless driving, and fined $175. The family of the dead were understandably furious. Broderick has since said he's "willing to" meet with Doherty to apologize, but he hasn't. Rachelle Unreich, "Matthew Broderick: One of the Guys", Detour, June-July 1996: "I'm Jewish, but I've never been attracted to religion, and I don't know what the hell to make of anything."